3 stars of bizarre musical mobile game transfer. 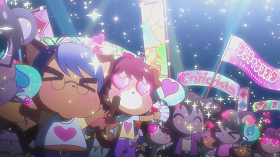 Show By Rock started life as a rhythm video game, released by Sanrio for iOS and android devices. The anime adaptation is written by Tōko Machida (DRAMAtical Murder), directed by Takahiro Ikezoe and animated by studio Bones (Fullmetal Alchemist). Cyan (Bryn Apprill – Assassination Classroom) is a first year student, who wants nothing more than to join the school music club, but is too shy to ask. While trying to psych herself up one night, she decides to play a rhythm game on her phone. As she wins the coveted guitar “Strawberry Heart” (Justin Cook – Dragon Ball Z), she finds herself pulled through her phone and into a digital world, known as Sound World. Here she witnesses a popular band known as Trichronika, being attacked during a performance by a “Dark Monster”. With the help of her guitar she is able to defeat the beast and save the band. 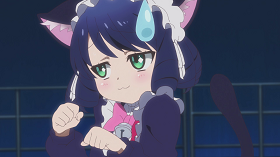 It is then she notices that she has now become a catgirl, with ears and a tail. 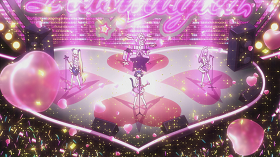 Everyone present at the concert heard her play and she is immediately headhunted by Maple Arisugawa (Sonny Strait – One Piece), owner of Banded Rocking Records, who wants her to be the final member of his band Plasmagica. This is her dream come true, so she agrees to join the other members, ChuChu (Alexis Tipton – Free! Eternal Summer), Retoree (Caitlin Glass – Yurikuma Arashi) and Moa (Monica Rial – Tokyo Ghoul) in their quest to take Midi City by storm. Unsurprisingly, the evil Unicorn Virtual Music Inc. also have designs on her and it seems she may have been chosen to save the world and won’t be allowed home until she does. 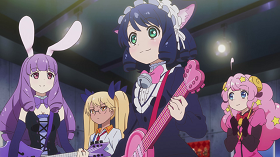 Show by Rock is pretty good for a novelty, but it does wear off relatively quickly. The animation style is interesting, switching to CG for large chunks of the action (whenever the bands play) and the soundtrack isn’t too irritating. It seems to feature plenty of the characters from the game, although I haven’t played it myself, but unfortunately the lack of any real storyline lets it down in the end. It’s more of a fluff piece than anything, colourful, bright and cheerful, but never likely to take the world by storm. 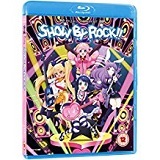 Show By Rock is available to buy now on Dual Format DVD and Blu-ray.